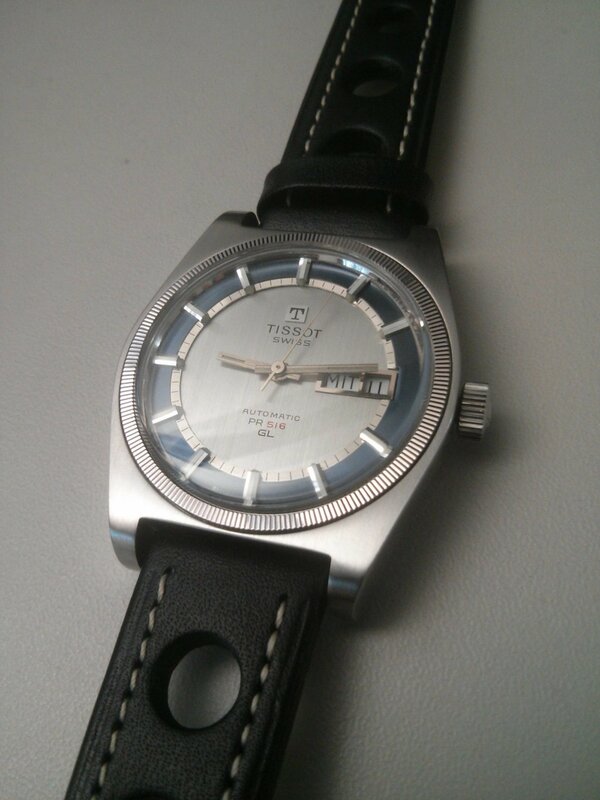 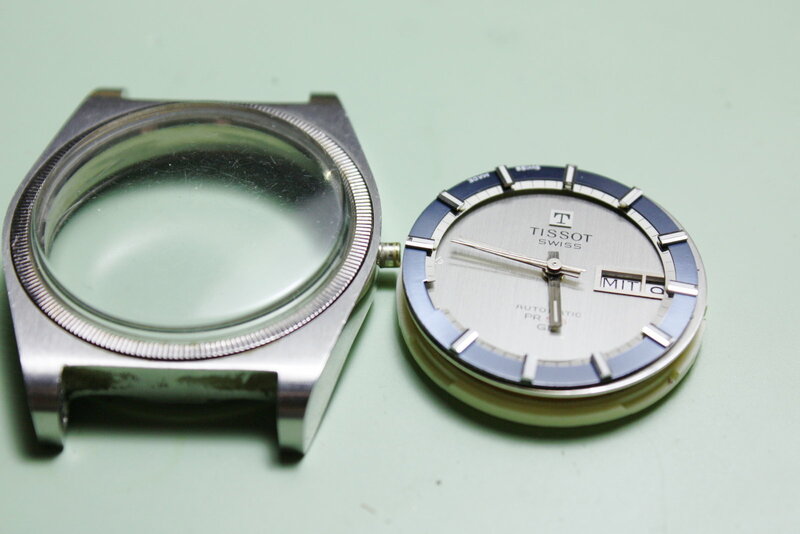 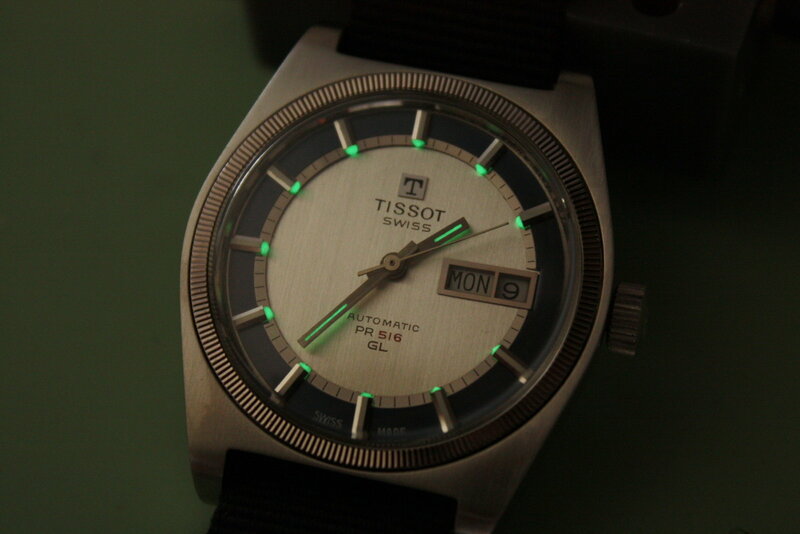 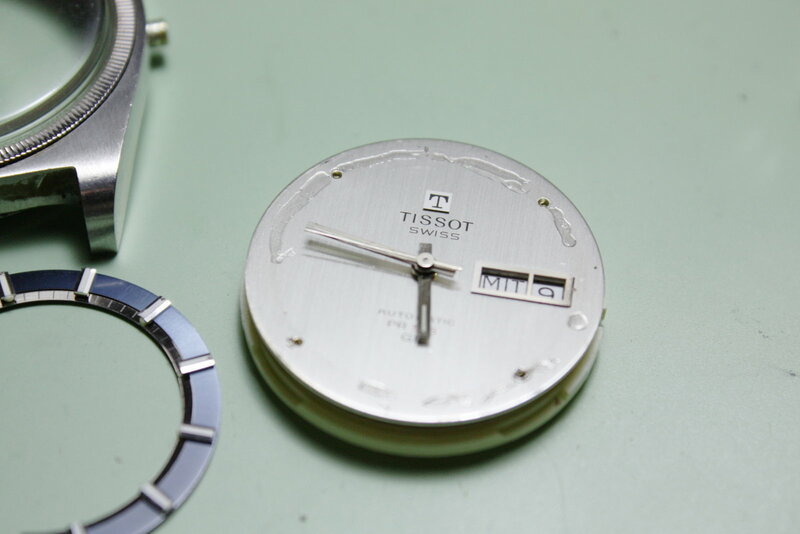 This is a late 1960s / early 1970s watch from Tissot. 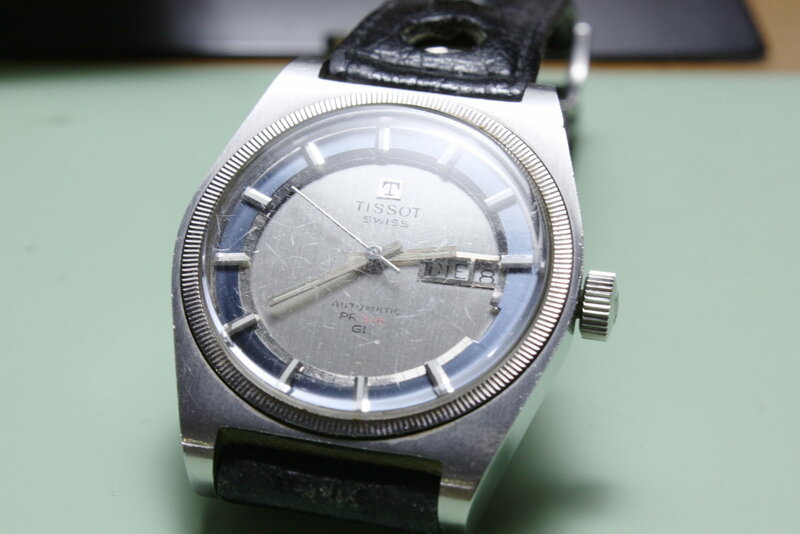 It´s quite worn with lots of scratches on the crystal, and the hour marker ring came off, too. 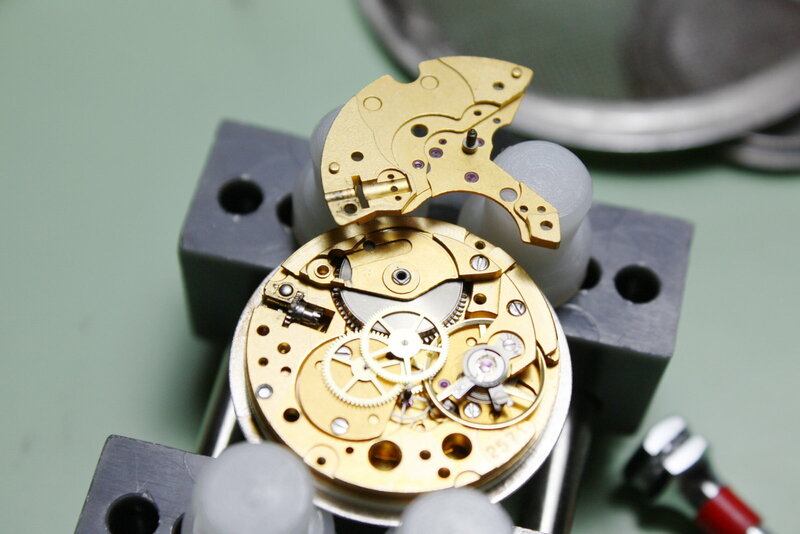 Under the rotor, yet another implementation of a bidirectional automatic winding mechanism - and not a stupid one. 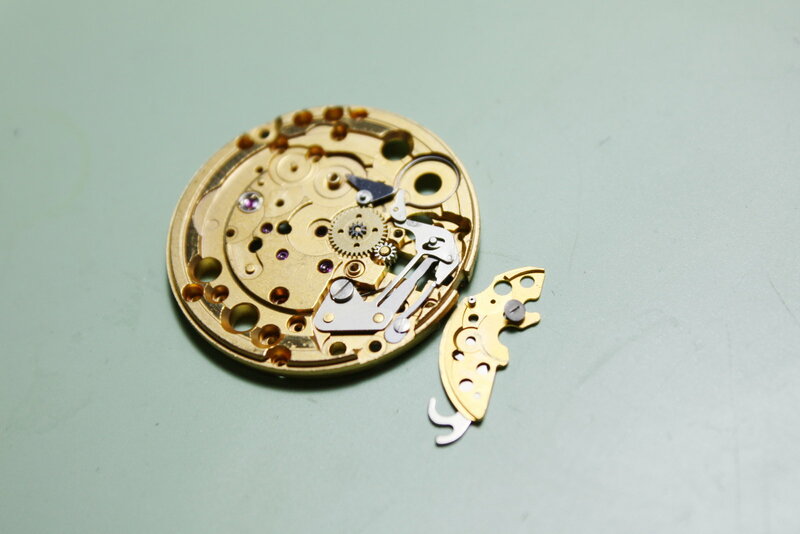 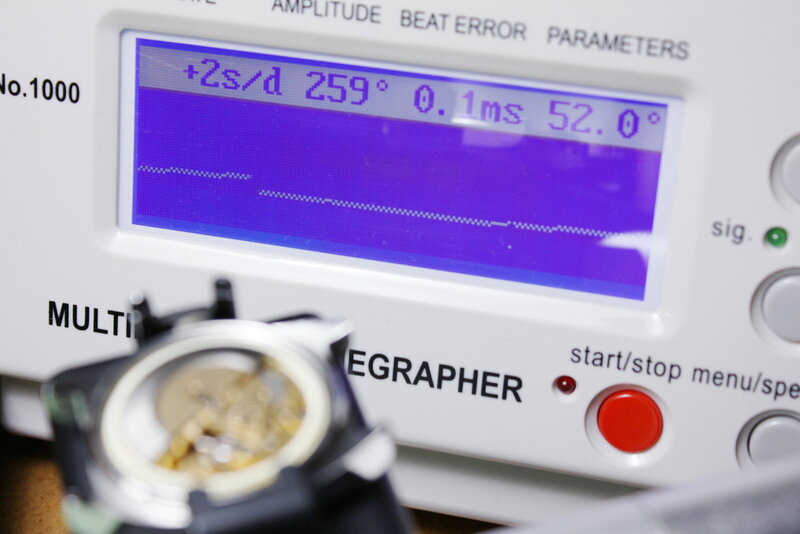 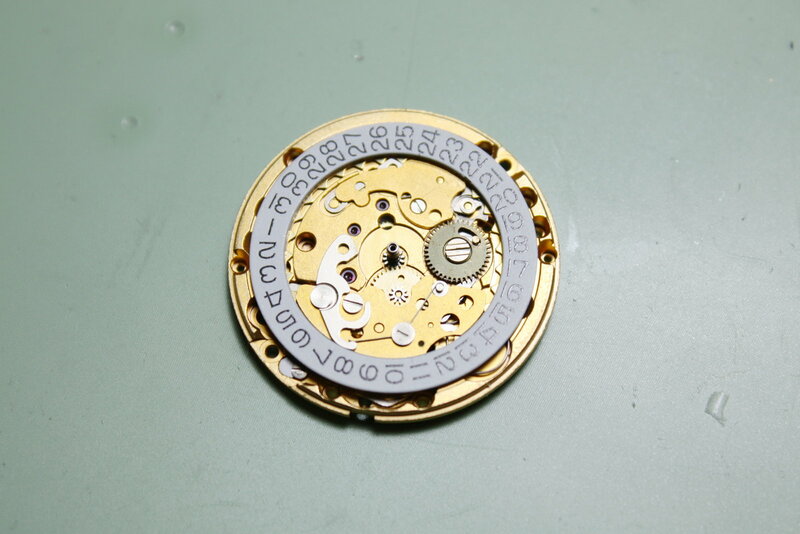 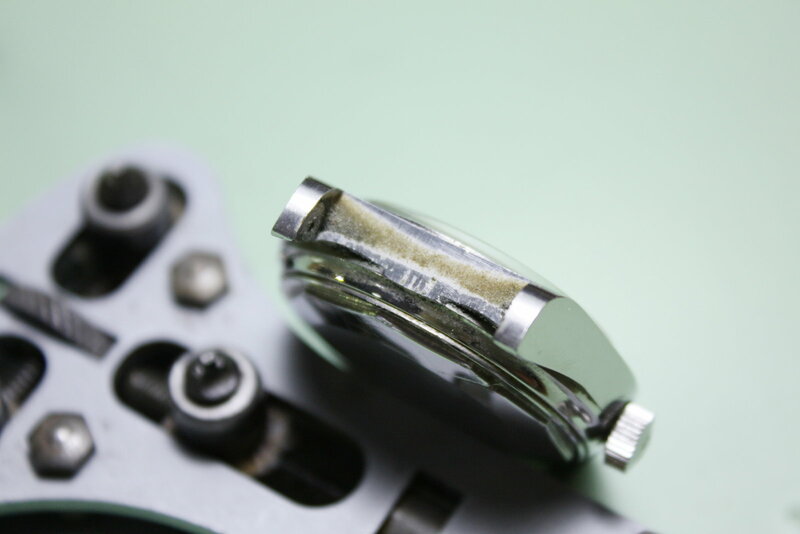 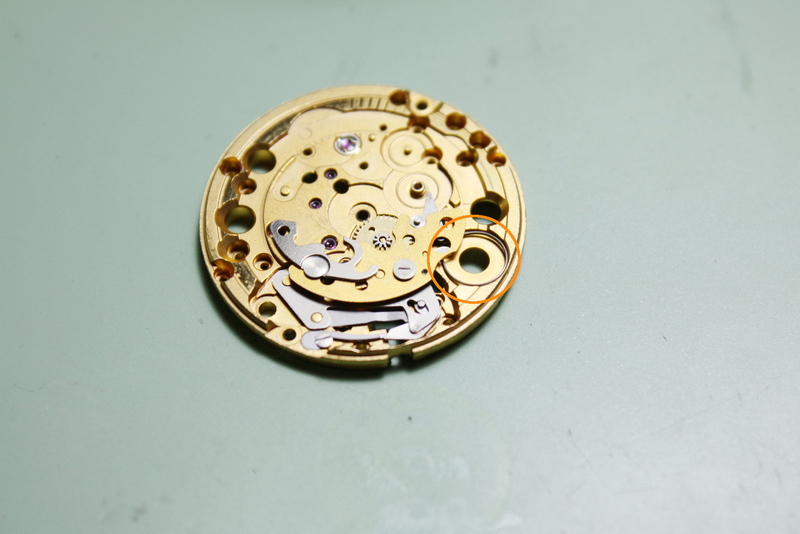 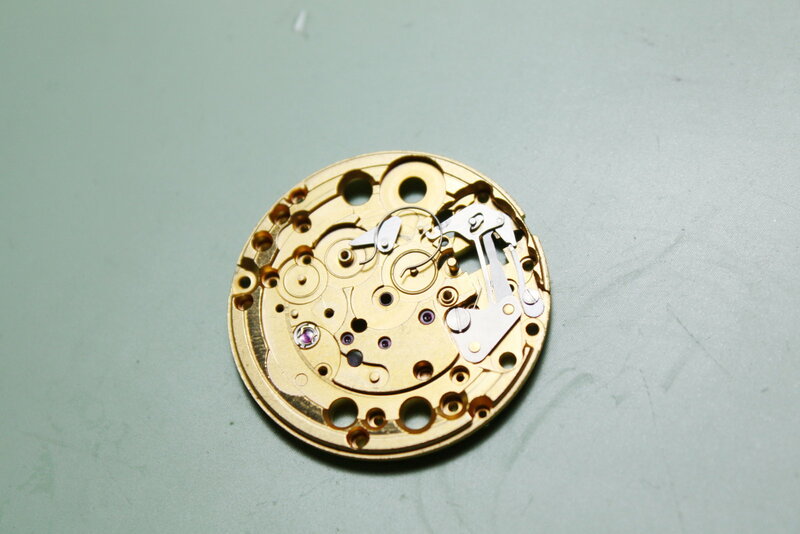 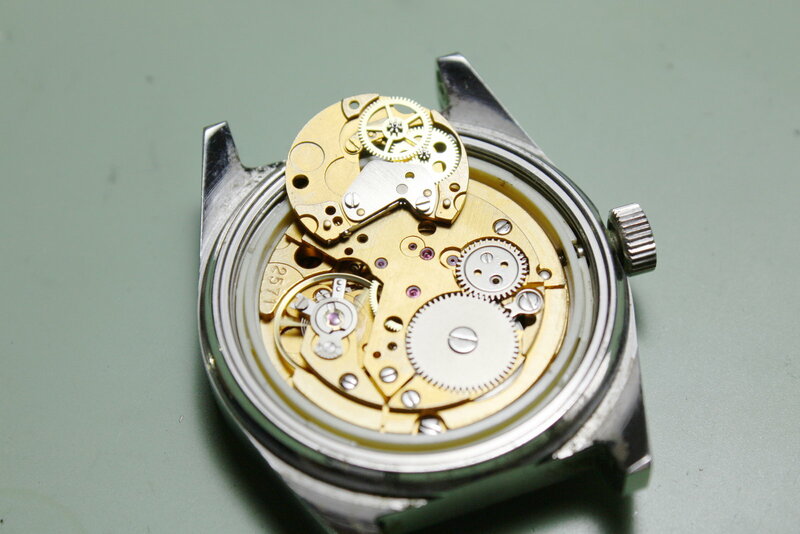 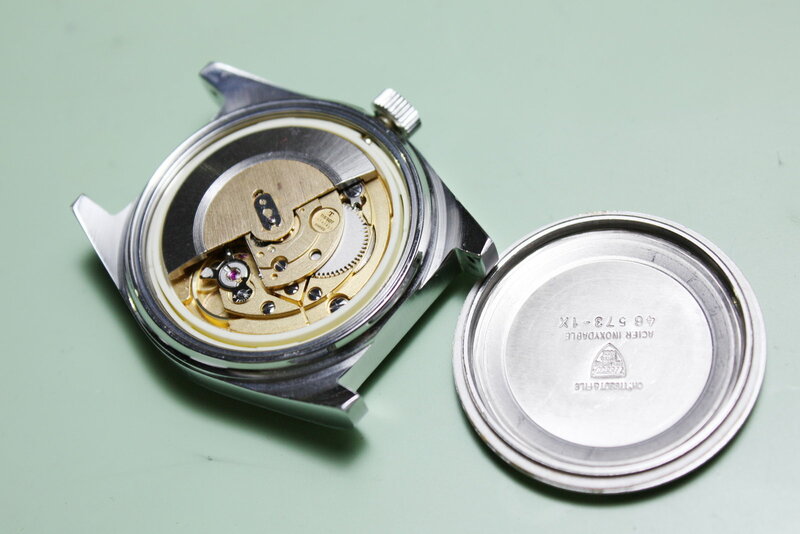 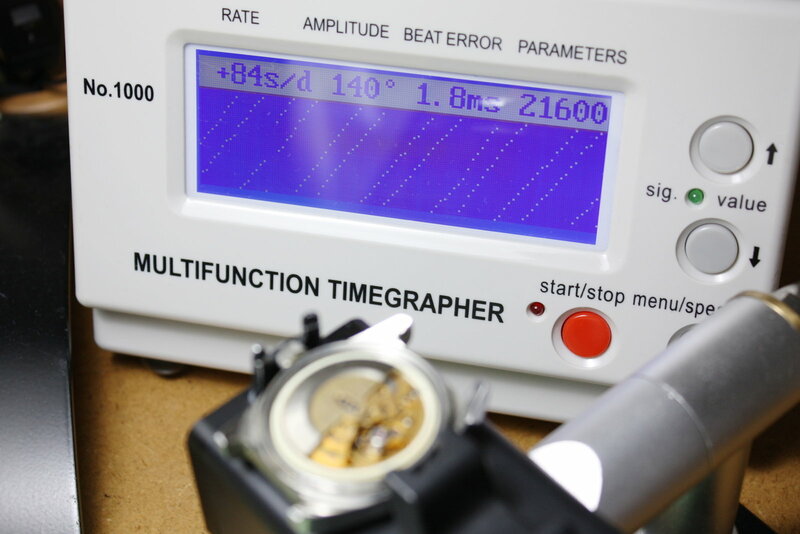 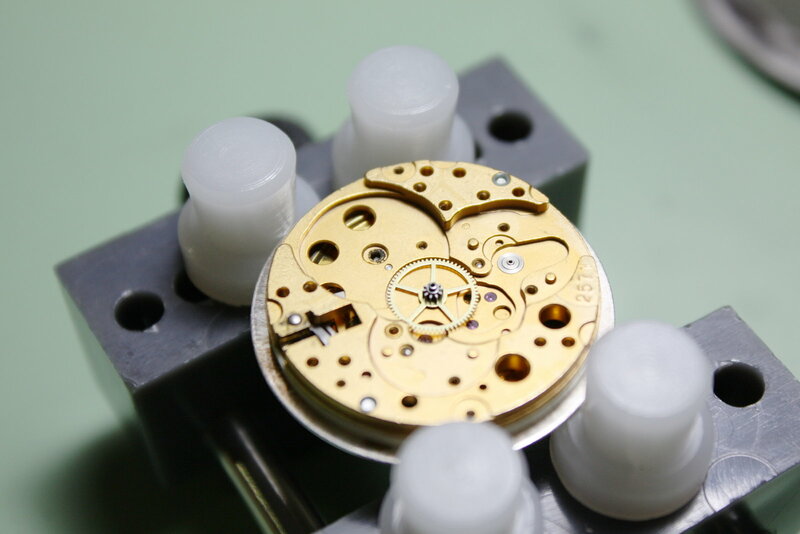 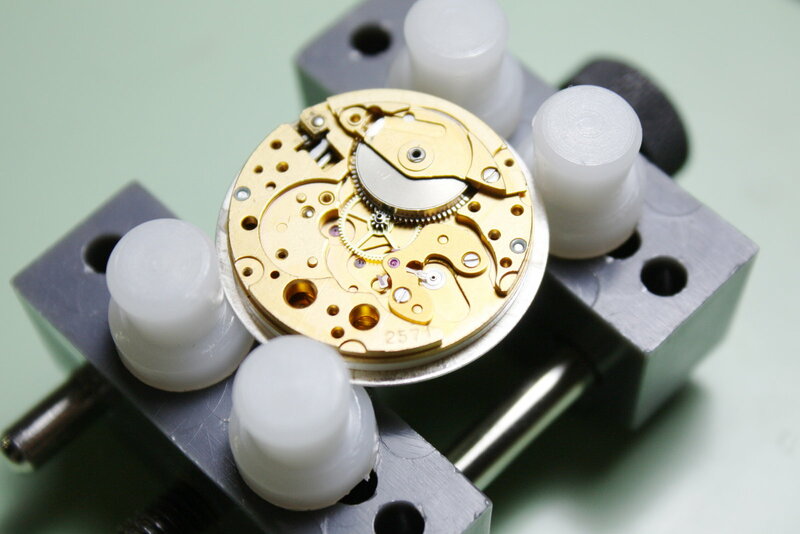 Without the autowinder, the movement looks and works like a conventional handwound timepiece. 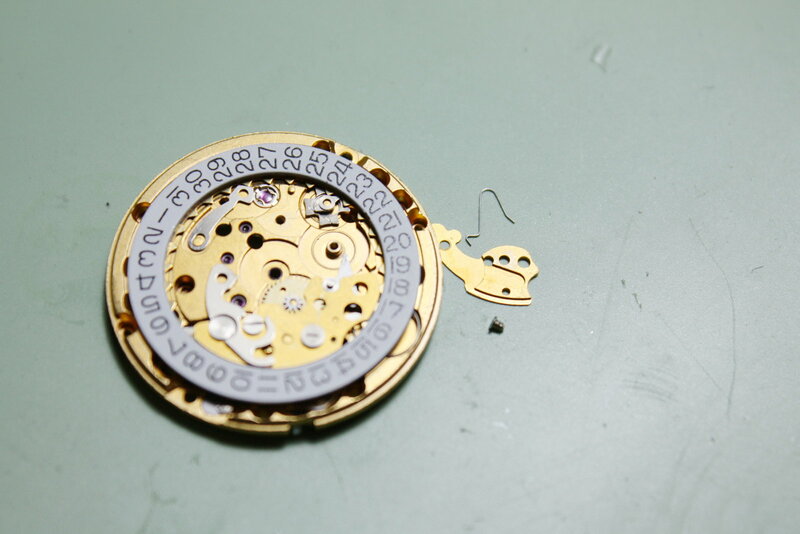 As noted above, the crown wheel is held in place by two screws, this is the shorter one. 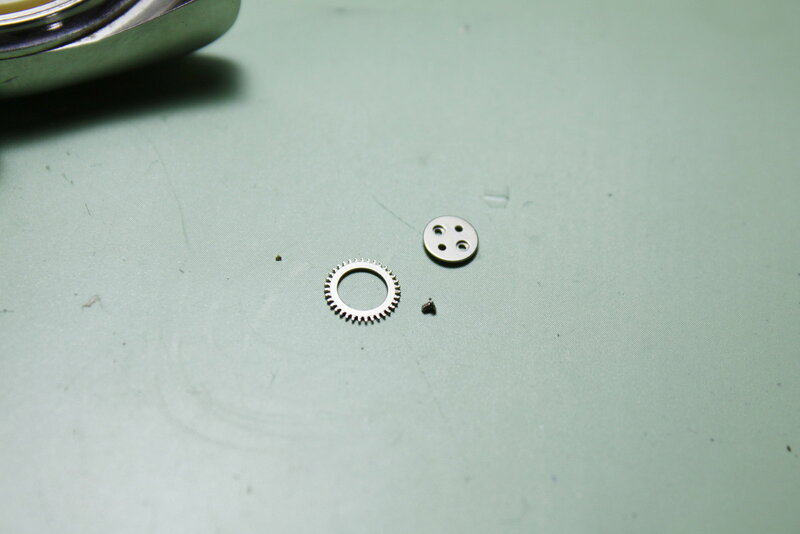 Under the ratchet wheel one of the many springs inside this movement (this is the click spring btw). 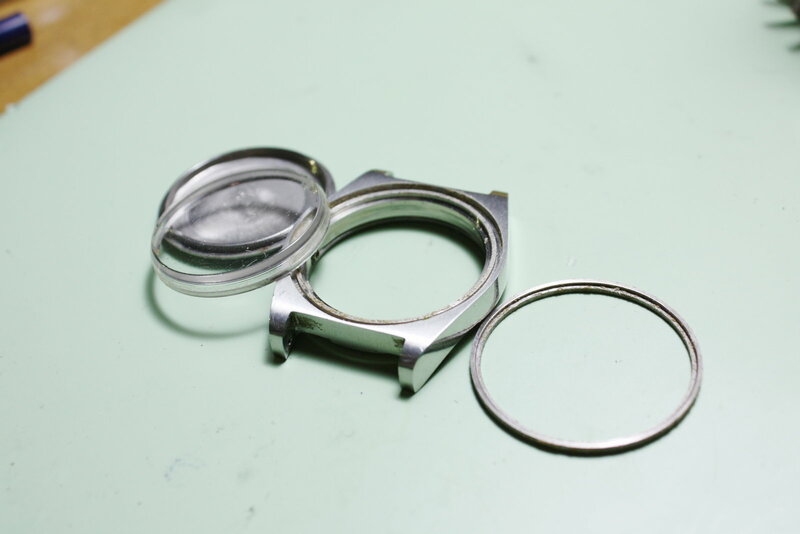 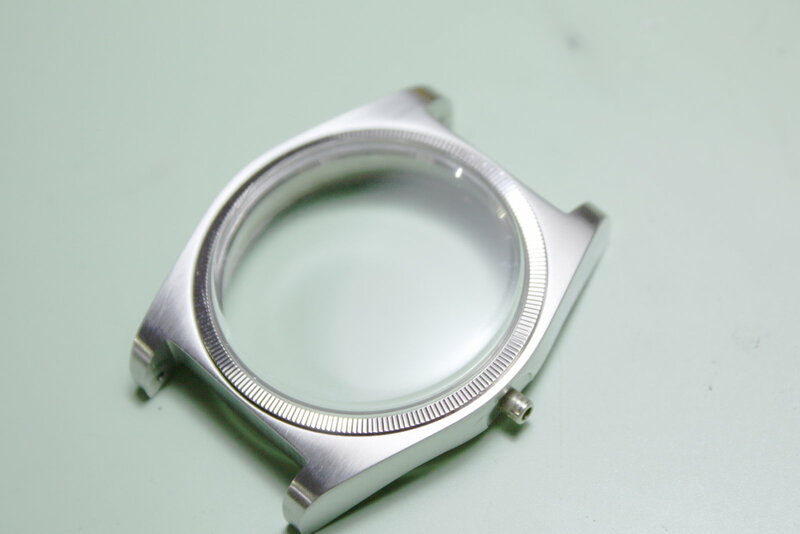 The glue residues under the "free flying" hour marker ring. 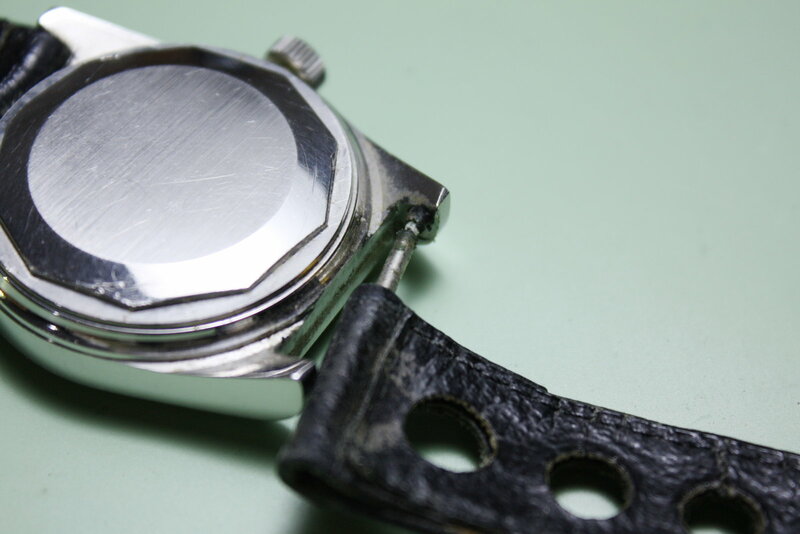 Barrel and its bridge removed. 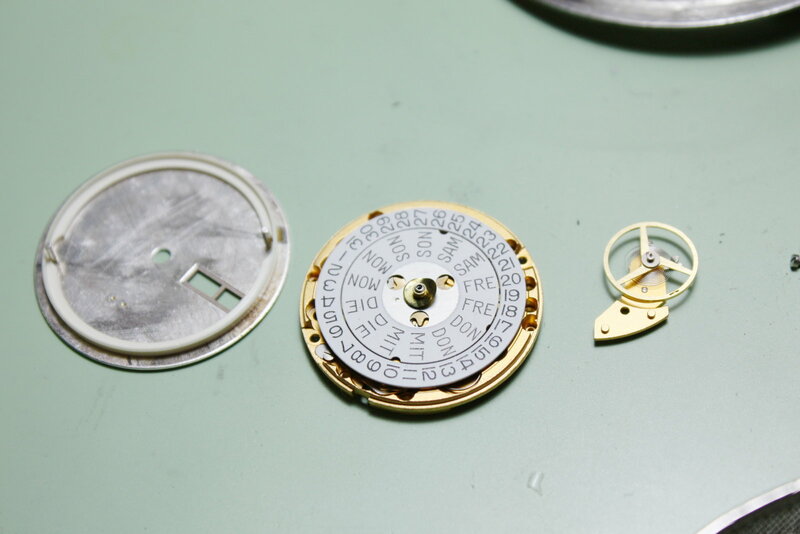 Under the dial, the day-date discs. 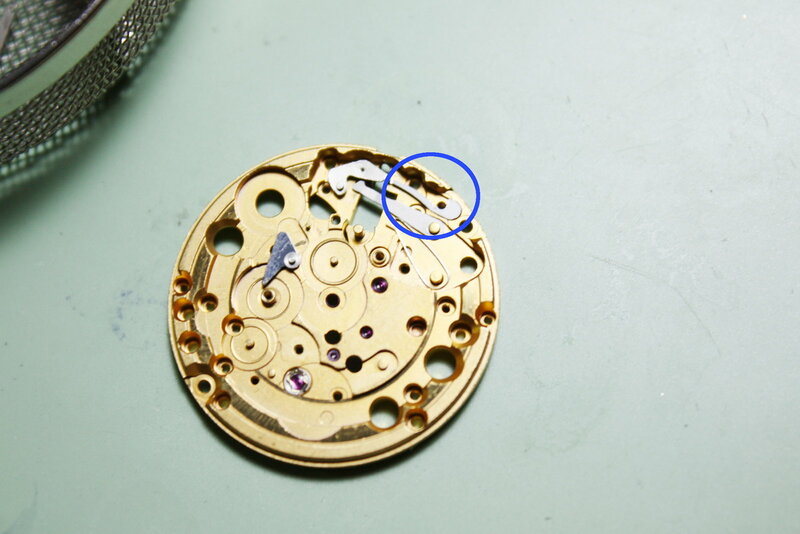 And with the day disc removed, we see a complex setting mechanism (there are some delicately serviceable springs here btw, this can be annoying). 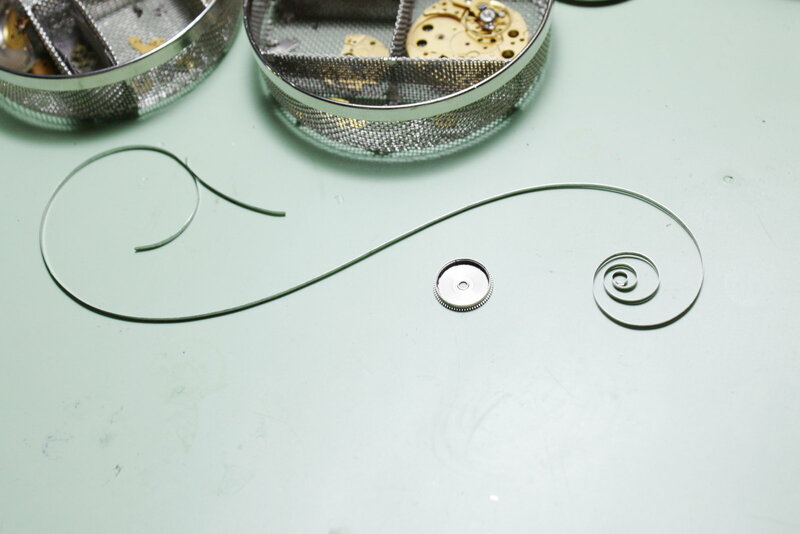 On the right - encircled in orange - we see the noted powerful spring. 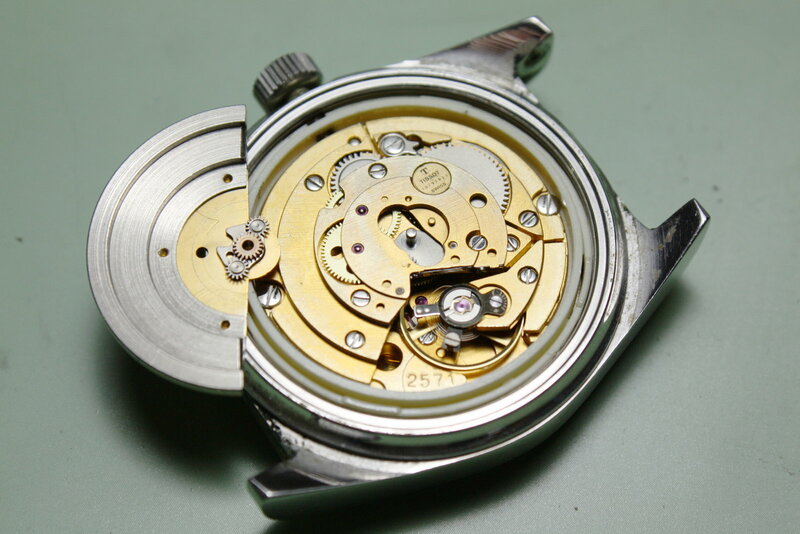 It can block the setting lever under certain circumstances which then prevents re-insertion of the winding stem...quite a no-go actually. 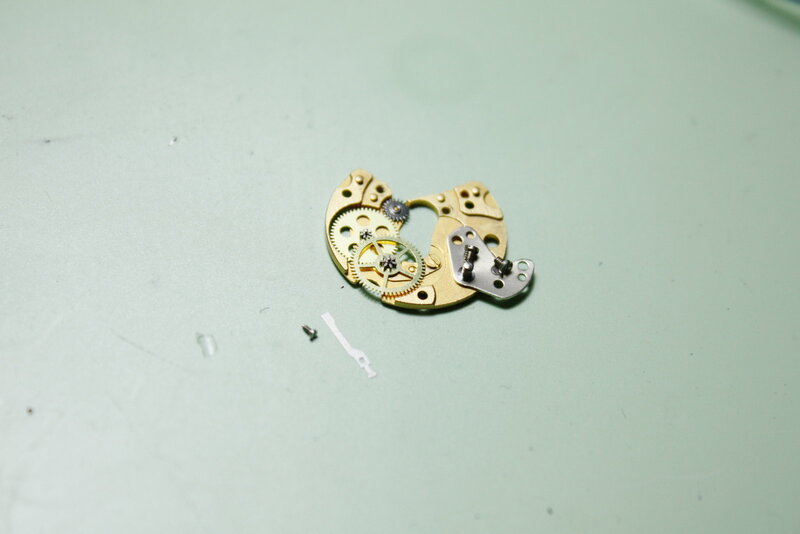 In the end I decided to omit this part entirely and I assume that it is not really vital for the function of this movement. 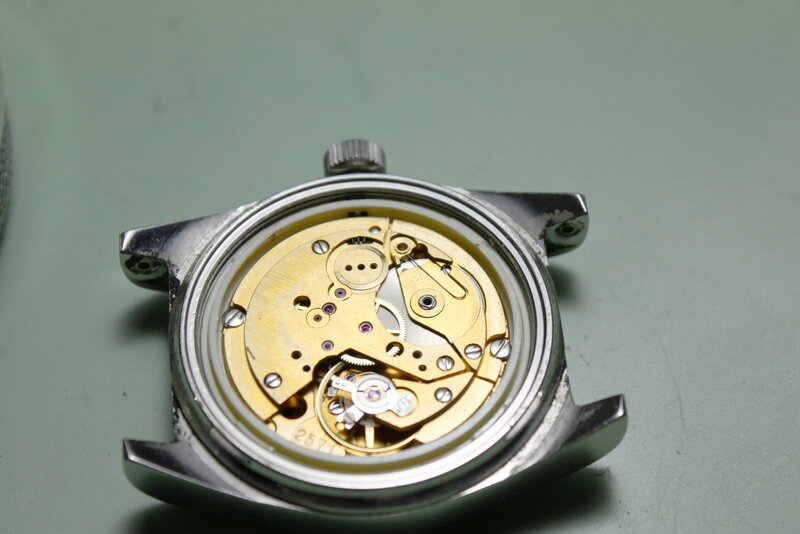 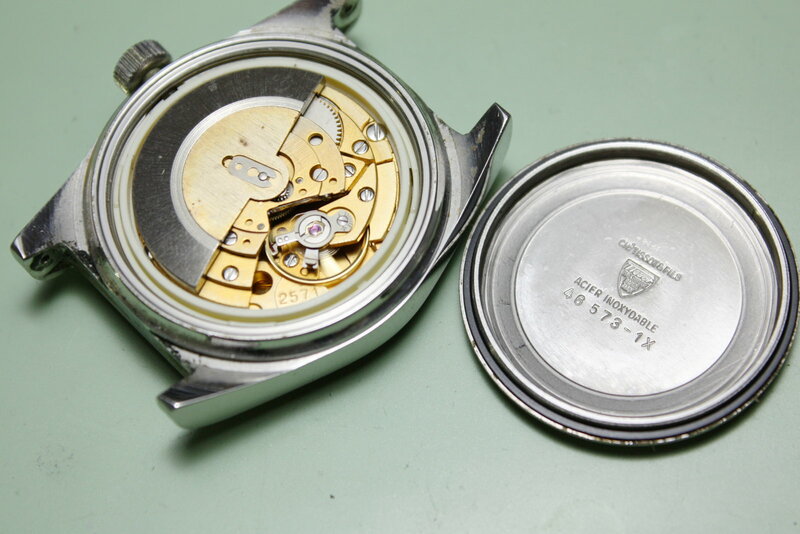 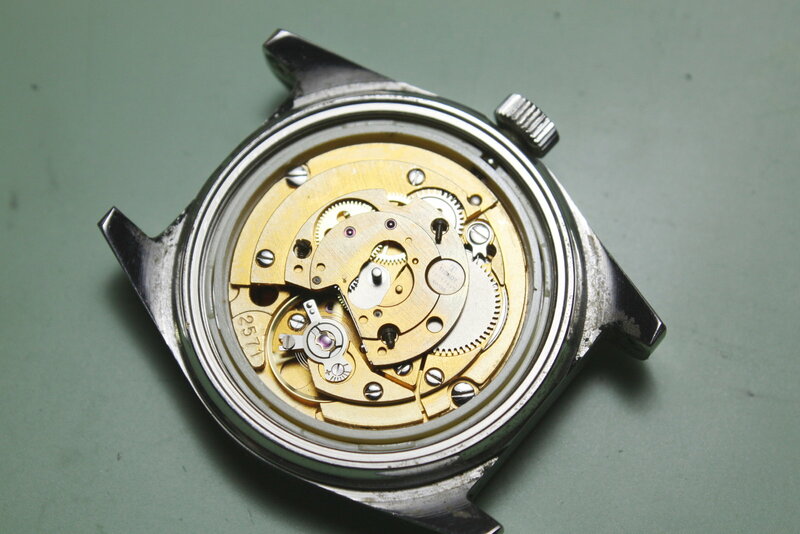 The force is still strong in this watch...(at least the long mainspring is still nicely "S"-shaped). 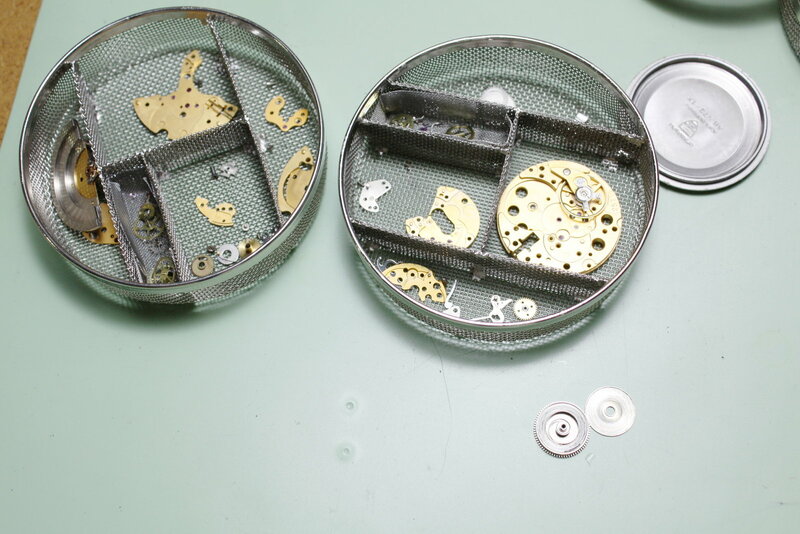 The diassembled case before cleaning and polishing. 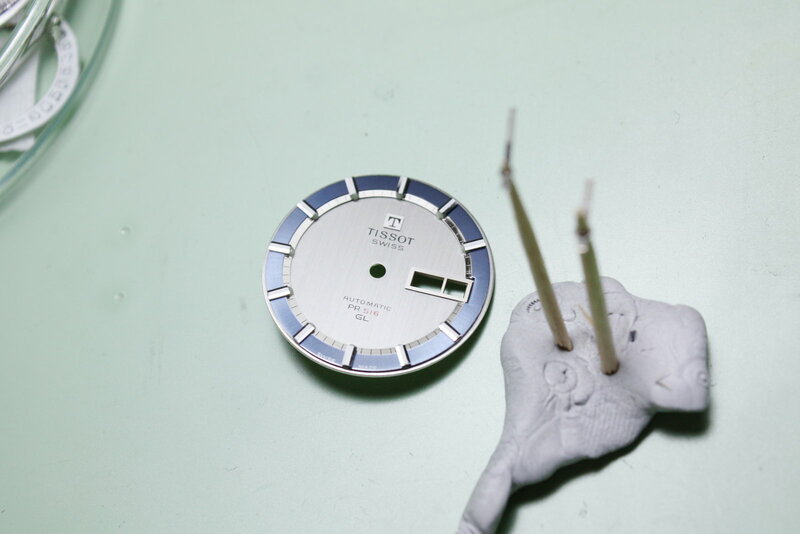 I also glued the hour marker back in place and I renewed the luminous paint on the markers and hands. 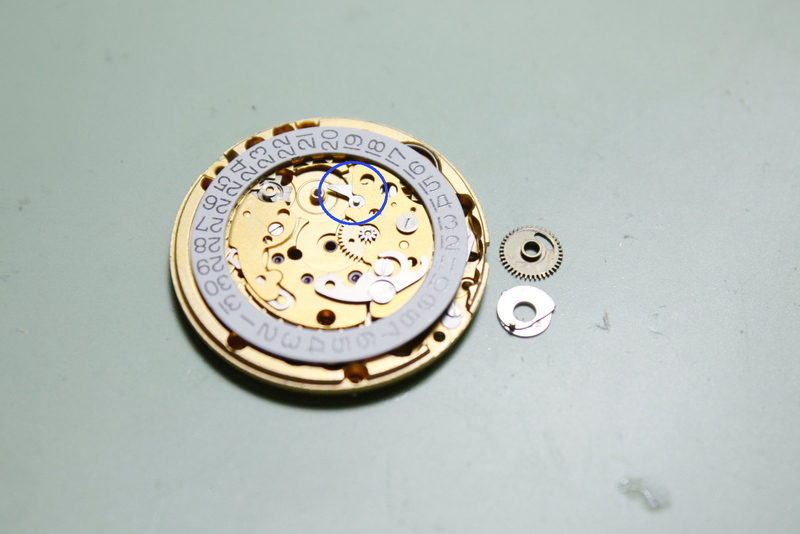 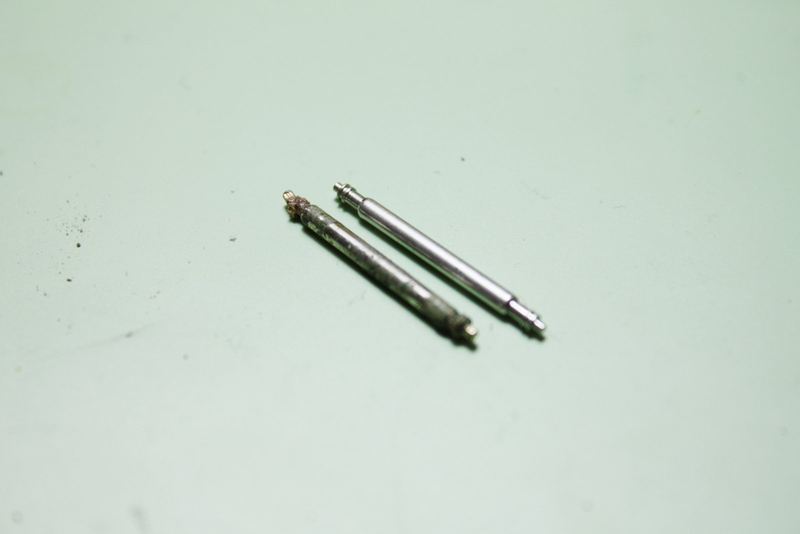 I also replaced the old watch strap spring bars with new ones (judge for yourselves which one was the new one...).